New military gains were reported from Syria. 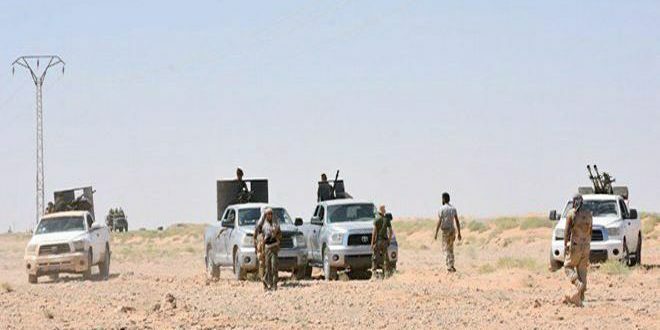 On Saturday, army units, in cooperation with the allies, carried out special operations against ISIS terrorists in the western countryside of Deir Ez Zour province, inflicting heavy losses in terms of personnel and equipment. On the eastern bank of the Euphrates River, Syrian Army and its allies reestablished full control over the village of Mazloum and several strategic sites in the town of Khasham, following intense clashes with ISIS terrorists, during which, scores of them were killed and their equipment destroyed. The army units were also chasing ISIS terrorists in Howeijet Saker area, and killed a large number of them. In addition, Syrian Air Force destroyed several ISIS fortifications and supply routes in the village of Khasham, the area of Howeijet Saker, and in the neighborhoods of Al Howeiqa, Al Jbaileh, Al Aridi and Kanamat in Deir Ez Zour city. Later, an army unit destroyed two ISIS cars on Islah-Mohassan road in the eastern countryside of the province.